The Toad in the Puddle is certainly a quaint name for a quilt block. It kind of makes you wonder where these names come from doesn't it? 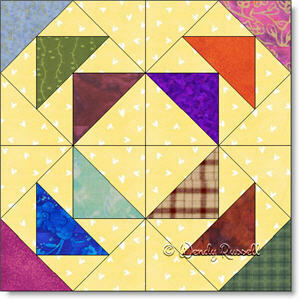 This quilt block is a simple four patch made using only flying geese units and half square triangles. Colour placement can totally change this block. In this example, I have chosen to make this a very "scrappy" version, but you could easily control the colour placement. The sample quilts shown use standard settings for the blocks -- one setting of the quilt blocks is straight across and the second is on point.